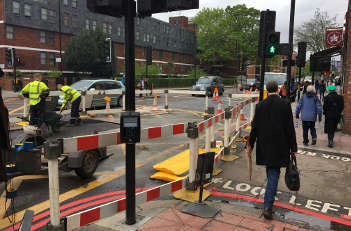 Ministers plan to make pavements the default location for new utility infrastructure, to cut down on roadworks and potholes, it has been reported. Transport secretary Chris Grayling told The Times the change is needed because potholes are far more likely to appear on sections of roads that had been recently dug up. He said this would cause ‘much less long-term damage’ as pavements were not exposed to the same heavy duty usage. However, he admitted that work to existing utility infrastructure would still have to take place on the road. He added that companies would not be allowed to dig up pavements on both sides of road at the same time, to ensure that pedestrian routes were retained where possible. Stephen Joseph, chief executive of the Campaign for Better Transport, told the Times: ‘Pavements are already in a terrible state, partly because we already have lots of utilities under there. The result is that the NHS spends an awful lot of money treating people who’ve had trips, slips and falls on uneven and badly maintained pavements. Mr Grayling also said that the Department for Transport would open a competition to develop harder-wearing road material by next winter to prevent new surfaces collapsing. Other reforms could include making utility companies pay more towards the inspection of recently completed roadworks. The paper also reported that the number of utility companies fined for over-running roadworks has doubled in five years. It said councils levied fines of more than £10m, with Thames Water the biggest offender, followed by British Telecom and National Grid. However,the scale of disruption may be much worse as some councils admitted that they no longer levied the fines.